Interview with Mark Casavant, SVP of Global Brand and Business Dev. When was the first time you heard a Klipschorn? Where were you and how did it make you feel? I first heard a Klipschorn in 1979/80. I was teenager and it was described to me as “The Klipsch” in a Hi-fi store in Orlando, FL. The experience was in a word “humbling.” An older salesman sat me down and said, “I see you’re interested in audio (I was carrying some recently purchased Mobile Fidelity vinyl) but let me show you what it’s really about!” He played the 1812 Overture (Tchaikovsky). My jaw hit the floor. The impact of the bass drum and cannon startled me, to say the least, and my heart was racing. “The Klipsch” were mysterious—I could not figure out how the cabinet configuration worked! When someone asked, “how do they do it?” another said, “folded-horn woofer.” I nodded, my head as in, “yes, of course.” I had no clue – haha! The sound I heard at age 15 was etched into my brain for decades. It was a while before I heard them again. However, when I was out of college, working at a dealer in Florida, I ordered a pair of Khorns for a customer and was excited to hear them in a real living space. We set them up in his home and listened in awe for hours while breaking them in. One of my first thoughts was that most people have no idea that the sound the Klipschorn reproduces is even possible. It's hard to imagine they’ve been available since the 1940’s! More people need to experience the same joy. What are a few of your favorite songs to listen to on this pair of speakers and why? I was impressed by jazz, rock, and classical recordings, especially well recorded albums from GRP and Telarc Records, back in the 80’s and 90’s. I leaned toward the dynamic tracks, with drums and a big soundstage — music that would “wake you up!” One example is, Copland: Fanfare for The Common Man. And other fun tracks from Telarc (classical). Drum tracks from Dave Weckl, Steve Smith, and Vital Information, and bass players: Victor Wooten, John Patitucci, and Brian Bromberg. And I can’t forget Joe Satrianni. Since we had a music side to the store, I had access to newest releases and it was easy to talk about music more so than the gear with customers. After all, the goal was to recreate the real living, musical, awe-inspiring feeling. Today, there are fantastic recordings of live sessions —vocals, jazz, fusion, and rock that shine on Klipsch speakers. I really value demo tracks for putting on “the show” like that salesman did for me when I was a kid. His demo changed my life; I’ve always felt that’s all it takes to make a big impact on someone…anyone! A powerful demonstration of music, in my opinion, should be life changing. What are a few of your favorite components to pair with the Klipschorn and why? I like well-designed and manufactured single-ended triode (tube) low-powered electronics for our Heritage line, especially for Klipschorns and LaScalas. The 105dB sensitivities of both models make 15 watts of power go a long way for a live sound presentation. And there is something to be said for circuit simplicity and low negative feedback in amplifiers: quality vs quantity. Harkening back to what Paul Klipsch said: “What the world needs is a great 5-watt amplifier!” I also appreciate great digital playback gear, for yes, CDs(!) and HD Tracks, and hi-res files from my NAS drives. I never stopped with vinyl. I have multiple turntables at home, so I have the analog side also. It’s fun to A/B a great recording in the different formats. There are virtues in both digital and analog. 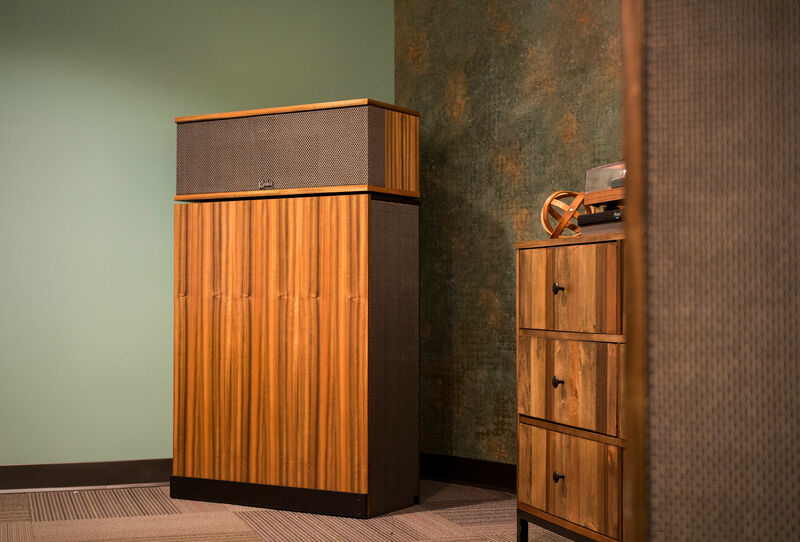 I love how Klipsch reveals those virtues, and the rewards of great electronics and recordings! What is the most memorable thing you’ve heard others say about the Klipschorn when they hear it for the first time? I watch my ‘clients’ very closely during demonstrations, while gradually turning up the volume to a live experience sound level. I have brought some to emotional, happy tears, and others to huge smiles. It brings me much joy. Typical comments are: “I never knew recorded music could sound so real on (Klipsch) speakers! I can touch the music and/or musicians!” When I hear similar feedback, I feel like I’ve done my job. Anyone! People who love (live) music. And... musicians—people who really know what instruments sound like, in live concert performances. Since you knew him, do you have a favorite story to share about Paul W. Klipsch (PWK)? Paul Klipsch was still directly involved with speaker designs and testing in Hope, well into the 90’s. He was often testing new horn designs in the anechoic chamber, which sometimes led to comical outcomes. His technicians literally hand-formed them from fiberglass over many weeks, so “handmade with blood, sweat and tears” really meant something over the decades. PWK was a perfectionist. If he didn’t like the measurements, he would sometimes spew colorful language while throwing a folding chair across the laboratory. At this point, the young engineers (including Kerry Geist and Roy Delgado) would scatter to their respective offices upon hearing how upset Paul was. No one wanted to make eye contact with him.